The 96 mile West Highland Way links Milngavie, just outside Glasgow, to Fort William in the Scottish Highlands. It passes through some of the most spectacular scenery in all of Britain, from lowland Scotland into the heart of the Highlands. 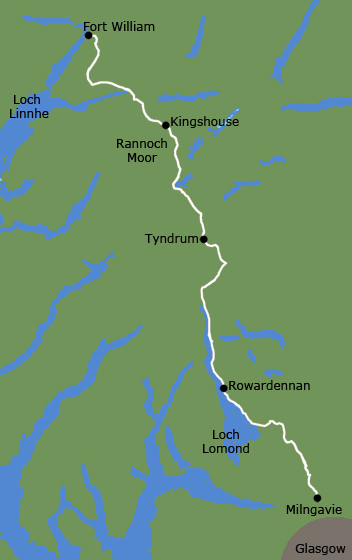 From Drymen to Tyndrum the Way traverses the Loch Lomond & Trossachs National Park. 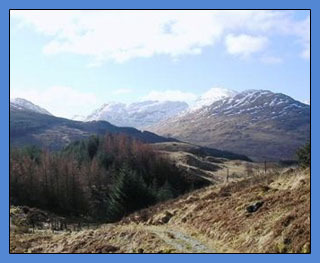 You start your self-guided West Highland way holiday at Milngavie. The Way starts gently, undulating through woods and farmland, it winds along the wooded banks of Loch Lomond, across the wilderness of Rannoch Moor, over the mountains above Glencoe to a dramatic finish at the foot of Ben Nevis – Britain’s highest mountain. Much of the Way follows ancient and historic routes of communication and makes use of Drove Roads or Military Roads built to help in the control of Jacobite Clansmen. The route is sensibly waymarked and generally easy to follow with the aid of a guidebook or map. The first half of the route crosses gentle valley floor terrain or traverses their sides and only occasionally rises to 300m/1000ft. North of Tyndrum the terrain is a little more challenging as the Way crosses open countryside - Rannoch Moor (445m/1460ft), the Devils Staircase (548m/1797ft) and the Lairigmor (330m/1082ft). Each night on the trail you stay in in prebooked selected accommodation, with breakfast provided. Your luggage is collected daily and moved to your next accommodation. Our self guided holidays are booked on an individual basis and therefore you can start your West Highland Way self-guided holiday on any date of your choice between April and October. *Single supplement - There are very few single rooms along the route and therefore the accommodation owners generally allocate a double or twin room for single occupancy. We can accommodate one single occupancy per booking for the average supplement of £35 per night. If you require additional single occupancy rooms, they will be charged at the extra cost incurred. This can be up to full double/twin room rate. Extra nights/rest days can be added to your itinerary. Price from £50 per person per night. Generally this is a moderate route though some strenuous walking is encountered e.g. on Rannoch Moor (445m/1460ft), the Devils Staircase (548m/1797ft) and the Lairigmor (330m/1082ft). The terrain varies from lowland moors, woodland, rolling hills, to high mountainous regions in the Scottish Highlands. Evening meals, packed lunches, drinks and snacks, travel insurance, travel to St Bees and from Kirkby Stephen, souvenirs, laundry services, etc. Accommodation is provided in carefully selected walker friendly B&Bs, Guest Houses, small Hotels and Inns. We try to book rooms with ensuite or private facilities every night, however in a few villages ensuite accommodation is limited and we may have to book rooms with shared facilities for one night of your holiday. The 96 mile West Highland Way links Milngavie, just outside Glasgow, to Fort William in the Scottish Highlands. It passes through some of the most spectacular scenery in all of Britain, from lowland Scotland into the heart of the Highlands.The following is intended to provide further information about the route. Please note that all distances and heights in this document are approximate and along with all the other information are provided as an aid to describe the route. Several guide books providing more detailed route descriptions and information are available. Milngavie (height above sea level 50m). Set amidst beautiful countryside this busy town is just 7 miles northwest of Glasgow and is the official start point of the West highland Way. The official start of the West Highland Way is a granite obelisk in Douglas Street, Milngavie. The Way leaves the town centre and enters Mugdock Country Park. On leaving the park the route continues northwards on good paths through rolling farmland. On route to Drymen the Way passes through Dumgoyne village. The Way enters Garadhban Forest and follows a forest track for a few miles. Upon leaving the forest you can either follow the alternative route to Milton of Buchan and then the road to Balmaha, or follow the path as is climbs almost to the summit of Conic Hill (360m), on a clear day there are wonderful views over Loch Lomond. The Way then descends to Balmaha, and passes the National Park Centre. A woodland walk along good paths or tracks for most of the route but it can be twisty and undulating in places. The Way runs close to the eastern shore of Loch Lomond. The Way follows a forestry track for approx 2 miles to Ptarmigan Lodge, 300m further on the Way divides. The right hand, higher path follows a forest track and is easier going. The lower route goes down steep stone steps toward the shoreline. It is hard going in places; sometimes steep above the loch and sometimes scrambling among boulders. The two paths run for 4 miles then converge and continue through pleasant woodland, for a further 3 miles to Inversnaid. The Way then continues along the side of the loch but the going is more difficult and the path for the next few miles is regarded as one of the toughest sections of the Way. Two miles before Inverarnan the going is much easier. The historic, and somewhat eccentric, Drovers’ Inn at Inverarnan is a great favourite with its range of good value meals and selection of beers and whiskies. It is well worth a visit, if only to see the collection of stuffed animals and birds. The Way continues along good paths and tracks, much of which is an old military road. This is the gateway to the Highlands and the Way gains height as it leaves the Loch Lomond basin and rises to 250m. Initially through a forest the way continues along good paths and tracks with some moderate descents and ascents. The Way continues for 7 miles along good paths and tracks following the line of an old military road to the Bridge of Orchy. Depending on availability accommodation is either booked at Bridge of Orchy or Inveroran, which is another 3 miles along the Way. There is good going underfoot as you cross Rannoch Moor, one of Britains largest and wildest moors. The path climbs steadily to its high point at 450m before descending to Kingshouse. The scenery is spectacular but you are highly exposed and in bad weather this can be a very tough stage of the Way. Kingshouse Hotel is closed for refurbishment during 2017 therefore accommodation is booked at Glencoe/Kinlochleven with return transfers included in your holiday. The Way follows the route of an old military road. 3 miles beyond Kings House the Way climbs steeply up the Devils Staircase. At 550m this is the highest point on the Way. There is now a long descent into Kinlochleven. This again is a hard and exposed stage in bad weather. In the first mile the Way zigzags steeply up the hillside to meet an old military road (250m). The highest point on todays route is Lairigmor, the high pass (330m), though there are no more serious gradients as the route continues on good paths with high mountains on both sides. The final stretch is a bit of rough walking through Nevis Forest, with Ben Nevis (1344m) the highest mountain in the British Isles, visible through breaks in the trees. The Way descends into Glen Nevis and follows a road for the final 1.5miles to Fort William and the end of a wonderful route. Fort William is the largest town in the west Highlands of Scotland. It is surrounded by magnificent scenery and has an important history. There are high mountains, lochs, beautiful glens, forests and beaches in between. This is a huge outdoor playground which caters for a wide range of activities. Fort William is an excellent location to spend an extra day or more. There is a wealth of on land, and on water activities. Many people stay a day longer just to climb Ben Nevis. Please contact us if you require further information. Reduced price ‘Advanced tickets’ can be purchased from approx 12 weeks prior to departure. Prices can vary greatly and the cheaper tickets sometimes only become available approx 6 weeks prior to travel. The train station in Milngavie is a short walk from your accommodation. Glasgow has two mainline stations: Central and Queen Street (a shuttle bus service operates between the two stations), they are readily accessible from most UK mainline stations. During the day trains depart regularly to Milngavie from both stations. Approximate journey times – From Glasgow 25 minutes. From London 5.5 hours. The train station in Fort William is a short walk from your accommodation. On weekdays a few trains a day depart Fort William for Glasgow Queen Street (first train 07:42). A limited service operates at weekend, please visit www.thetrainline.com for timetable information. The central bus station in Glasgow is Buchanan Street. The bus stop in Milngavie is a short walk from your accommodation. Approximate journey times from Glasgow 30 minutes. The bus stop in Fort William is a short walk from your accommodation. Scottish Citylink operates daily bus services from Fort William to Glasgow. Booking in advance is recommended Tel - 0871 2002233. Approximate journey times to Glasgow 3 hours. Limited non-secure parking is available in Milngavie. Please contact us if further information is required. Glasgow International is the nearest airport to Glasgow city centre. A frequent bus service operates between the airport and Glasgow train and bus stations. Approximate journey times to Glasgow city centre 30 minutes. Glasgow Prestwick airport is approx 30 miles from Glasgow city centre. A regular bus service operates between the airport and Glasgow Buchanan Street approximate journey time 50 minutes. A regular train service operates between the airport and Glasgow Central station approximate journey time 45 minutes. Dear Dean & Corinna, just wanted to thank you for both the self-guided trips you have arranged for us. In May 2016 we did the Coast to Coast and we just completed the WHW last month. The accommodations on both trips were wonderful, I loved the variety on the Coast to Coast. The BNB on the WHW were awesome. Wouldn’t hesitate to recommend NWW to my friends, thanks again. Dean and Corinna, just a quick note to say thank you for the superb organisation and most warm welcomes we received on our trip on the WHW. We all had a great time and really enjoyed the guest houses we stayed in. Many thanks and we will be in touch if we ever do something similar. Dear Dean & Corinna We completed the WHW a week ago. It was a terrific walk, and we thoroughly enjoyed it, particularly the last 3 days. …..The guidebook and map are excellent in all respects.Overall this has been a great experience and we are proud of our efforts. Many thanks for helping us to get there! Thank you Dean for your excellent service. Everything ran smoothly and we all enjoyed the week. You did well and we appreciate it very much. G’day Dean, Does it happen often – 8 perfect days on the WHW? The very best form of family reunion possible! Your contribution was superb and very much appreciated. You must command a lot of respect among these Highlanders that your clients get the best beds in the most strategic locations. Congratulations! We will continue to promote your business in far off Canberra and wish you well into the future. Where is the best place for me to post an on-line review? I have just returned from walking the West Highland Way & want to say how terrific it was. Everything went very well with no problems & we all enjoyed it very much. One of the best things (besides the exceptionally friendly people we met along the way & the stunning scenery) was the good mix of long & short days which made for a nice relaxing time. Thank you very much for your great organisation. This is my second trip with NW Walks & I am sure there will be many more. Thought I would take this opportunity to say thankyou for organising the recent walk which I carried out with a colleague.Everything went so smoothly, the accomodation was always very good and everyone was so friendly. We were blessed with fine weather for the first 6 days with heavy rain only on the final day but even then it kindly stopped when we were about to come down through Glen Nevis. The whole experience was unforgettable, we had never attempted any walk of this kind before,now our appetite has been wetted we are planning another walk with you for next year. Once Again Many Thanks. I am contacting you to thank you very much for the wonderful arrangements. Everything worked very well - from the accommodation to the transportation of our luggage each day. Thanks to you we were able to concentrate on completing the walk. We would definitely consider using your company again for any future adventures. One month has already passed since Michael and I enjoyed Scotland's nature by walking the Westhighland Way. We made many nice acquaintances and had a wonderful time, also highly due to your friendly and cosy accommodations...A big thank you goes to "Northwestwalks", you chose excellent B&Bs, Guest Houses and Hotels for us, the luggage transport worked perfectly fine and you turned our holiday into a full success. We arrived home safely about a week ago after a well spent time on the West Highland Way. Thanks for the work of booking and arranging everything. We had a good time and it all went very smoothly in the accomodations and on track. 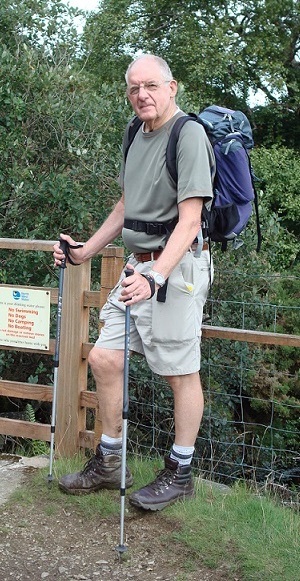 Just wanted to say thank you for the wonderful service when I did the West Highland Way and the Great Glen Way. I had a great time…I have recommended you to a few people…I look forward to booking another walk with you next year. I haven't had the chance to thank you for organizing our West Highland Way trek. We had great weather which helped but even the last blustery day, perhaps more typical of NW Scotland, was a real pleasure. What added to the trip, besides the beautiful landscape, was the camaraderie in the B and Bs plus the reward of raising a pint most evenings. You did us proud in the arrangements (and suggestions) especially given that I wrote you late.